The Jeep Wrangler is one of the most beloved SUVs in history. It has earned multiple awards over its lifetime, winning the hearts of critics and consumers alike. Now, the 2019 Jeep Wrangler in Boulder is back and better than ever. This year, it earns the distinction of winning Motor Trend’s prestigious “SUV of the Year” award. In order to do this, the Wrangler surpassed 35 other SUVs in a number of categories. One look at the Wrangler will compel you to step inside, and one test drive will want to make you take one home. Fortunately, our enticing Jeep Wrangler specials are designed to make owning the Jeep of your dreams more than just wishful thinking. Fun, freedom, and adventure are what the Jeep was designed for. In 2019, the Wrangler still has the classic Jeep elements that customers love most: rounded headlights, the iconic Jeep logo, a seven-slot grille, the spare tire mounted on the back, and of course the “Trail Rated Tough” badge that shows your Jeep has been put through a grueling test to prove that it can tackle the toughest of terrains near Denver Longmont Thornton. While all trim levels of the Wrangler share these common exterior amenities, they also have varying features that give each trim a distinct appearance. The Sport, which is the base trim, comes in either a two-door or a four-door body style depending on your preference. It is available with nine different exterior colors and either a hard top or a soft top to give it a custom appearance. The doors and windows can all fold down to let you truly experience riding in the open air. Seventeen-inch wheels are standard on the Sport. 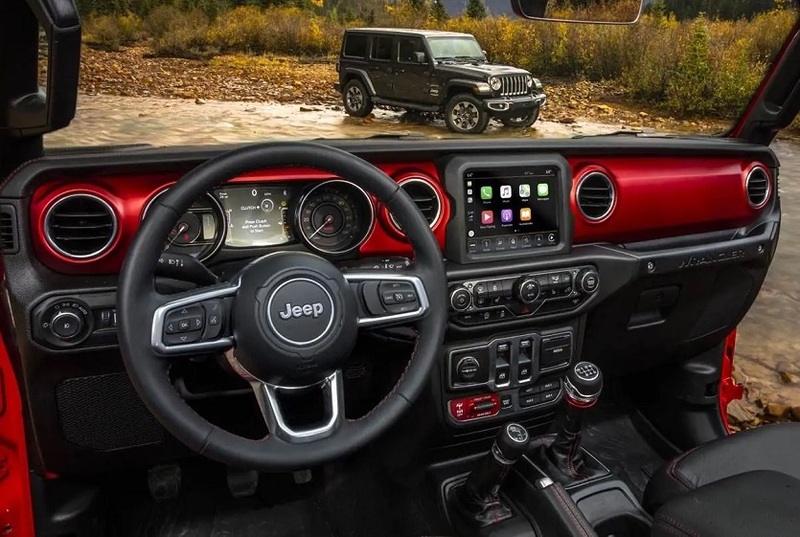 While all trim levels of the Jeep Wrangler look like they’re ready for an off-road adventure in Boulder Colorado, their luxurious interiors offer a quiet escape from the chaos around you, whether it’s flying mud or whizzing traffic. The Sport has two interior color options for the cloth seats, which are black and tan. The driver’s seat is manually adjustable and has two-way lumbar support. The front seats are reclining for convenience, and they have a split-folding design to maximize space for cargo if necessary. Air conditioning is standard, and the Sport has two 12V power outlets to keep devices charged between destinations. Illuminated cup holders and a vehicle information center that displays critical vehicle information is also standard. With the Sport you’ll get a five-inch infotainment display screen and an eight-speaker audio system. All versions of the 2019 Jeep Wrangler get the same base engine, which is a 3.6L engine with 24 valves. This engine generates up to 285 HP and 260 LB-FT of torque. It provides a towing capacity of up to 3,500 pounds. A more powerful 2.0L, turbo-charged engine is optional on all trim levels. This engine produces up to 270 HP and 295 LB-FT of torque. It also has a maximum towing capacity of 3,500 pounds. An engine block heater is also optional to improve the engine’s performance. Most trims in Boulder Colorado come standard with two-wheel drive and optional four-wheel drive except the Moab, which is designed with a four-wheel drive drivetrain. With its classic Jeep looks and legendary brand performance, there’s no reason not to consider a 2019 Jeep Wrangler. While we can’t pick out a top design and wheel size for you, we can encourage you to see the Wranglers we have in stock and take one for a test drive. Adding to the incentive is the fact that we offer Jeep Wrangler specials to help customers get those coveted interior features or higher-end trim level they’ve been wanting. Call, visit our website, or schedule a test drive to explore the Wrangler today.